Saw these guys play at the Black Heart some time ago at a Poster Roast event during the Camden Crawl, they were pretty brutal, lots of fun and very, very loud – zip forward to 2012 and across Europe to Hamburg to another Turbowolf show, this time in the cellar bar ofThe Molotow (our absolute *FAVOURITE* venue/club there). It was hot sweaty and properly crammed – you had to try and sandwich yourself between girls in the “queue” to the door, or be prepared for some very close groin to bum experiences with hairy drunken men… Once downstairs it was fairly easy to snake through the crowd to the corner bar for a great line of sight from stage right. That’s IF you were good at “mosh-frogger” that is (and we are). Andy on guitars (who we had only met the once before at Camden) had already granted us the chance to do a poster for an upcoming Brighton show – so experiencing the Hamburg Reeperbahn gig was fantastic inspiration… here is the piece we printed. 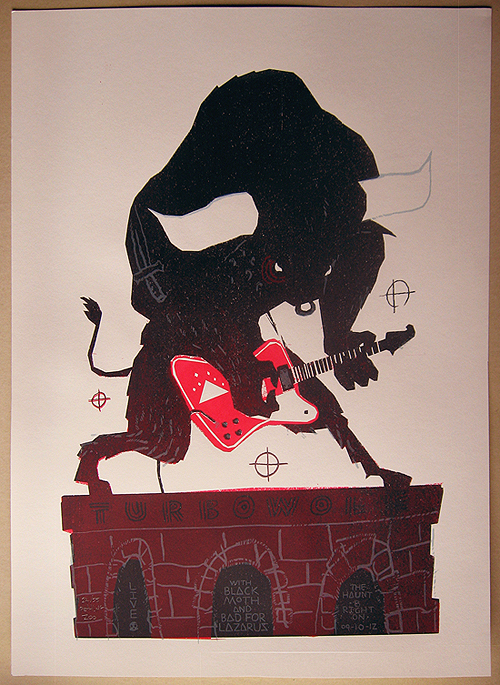 Following a visual theme of huge mythical beasts we opted for a minotaur – he’s playing Andy’s axe and has adopted his stance too – we were pleased that this met with the band’s smiling approval. The Haunt show here in Brighton was cracking by the way, all the bands were nice guys and the Zoo finally caught sight of Bad For Lazarus on (and off) stage! they were totally engaging and fingers crossed there will be a poster hook up for them soon. As usual guys, if you’d like to purchase one of these artifacts of ROCK, then do drop us a message (pzprints@gmail.com) – these are just £16 each for a limited time – then they will be hitched to £20. (we are having to address our demand vs edition rarity situation – don’t worry – we are on your side music fans… Peacepipes! This entry was posted in Friends, Gigposters, Screenprints and tagged affordable art, art, bad for lazarus, black moth, Brighton, collectables, concert, festival, gig, gigposter, hamburg, illustration, limited edition, memorabilia, minotaur, minotaur print, myth, petting zoo, poster, print, reeperbahn festival, rock n roll, screenprint, serigraph, the haunt, turbowolf. Bookmark the permalink.